La Mirada Theatre for the Performing Arts presents the Los Angeles premiere of the all-new, reimagined, environmental and completely immersive theater production of the legendary musical CARRIE THE MUSICAL. Performances are set to begin at Southern California's La Mirada Theatre for the Performing Arts (14900 La Mirada Blvd.) tonight, March 12, 2015 for a limited engagement through Sunday, April 5, 2015. Opening night is set for Wednesday, March 18, 2015 at 8:30pm. Based on the acclaimed novel by Stephen King, this completely reimagined, developmental and immersive production of CARRIE THE MUSICAL will reunite the original creative team and will include a revised book by Lawrence D. Cohen (screenwriter of the classic film), lyrics by Academy Award winner Dean Pitchford (Fame, Footloose), and music by Academy Award winner Michael Gore (Fame, Terms of Endearment). La Mirada Theatre will be completely transformed into Ewen High School, putting audiences, for the first time ever, at the center of the action in this bold and thrilling twist on the now-classic musical. Two-time Tony Award winning Broadway producers Bruce Robert Harris and Jack W. Batman (Pippin, Clybourne Park, On The Town) are working closely with Brian Kite, La Mirada Theatre for the Performing Arts and the creative team on this developmental production aimed for major productions around the country. Directed by Brady Schwind, and with choreography by Imara QuiÃ±Ã³nez, the cast will feature Emily Lopez as Carrie White, Misty Cotton as Margaret White, Kayla Parker as Sue Snell, Jon Robert Hall as Tommy Ross, Valerie Rose Curiel as Chris Hargensen, Jenelle Lynn Randall as Miss Gardner, Garrett Marshall as Billy Nolan, Bryan Dobson asMr. Stephens and Reverend Bliss, Michael Starr as George Dawson, Adante Carter as Dale "Stokes" Ullman, Ian Littleworth as Freddy "The Beak" Holt, Kimberly Ann Steele as Helen Shyres, Rachel Farr as Norma Watson, Teya Patt as Frieda Jason with Carly Bracco, Lyle Colby Mackston, Kevin Patrick Doherty, Chris Meissner and Amy Segal. "The story of CARRIE has endured in the popular consciousness for decades, but no one has ever experienced it from this point of view," producers Bruce Robert Harris and Jack W. Batman said. "The idea of placing the audience in the center of this world was just too tantalizing to resist." They went on to add, "We are working closely with the creative team to present an exciting new production of this reimagined, environmental/immersive staging of CARRIE THE MUSICAL. If all goes well at La Mirada, we are planning future productions for cities around the world, probably kicking off with Las Vegas, New Orleans and Toronto. It's going to be a thrilling ride." "Director Brady Schwind is building on CARRIE's legacy with his own unique vision for our show," creators Cohen, Gore and Pitchford added. "Making it an environmental experience for the audience is intriguing and daring -- like the story itself. We look forward to this next chapter!" The creative team includes Stephen Gifford (set), Adriana Lambarri (costumes), Brian Gale (lights), Cricket S. Myers(sound), Jim Steinmeyer (illusion design), Brian Kennedy (music director/conductor), Adam Wachter (music supervisor), Michael Donovan (casting), and Buck Mason (general manager). The Production Stage Manager is Heidi Westrom. 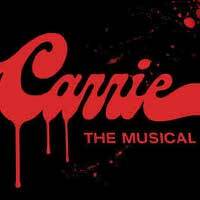 CARRIE THE MUSICAL will play the following performance schedule: Tonight, March 12 & Friday, March 13 at 8:00pm; Saturday, March 14 at 2:00pm & 8:00pm; Sunday, March 15 at 2:00pm & 7:00pm; Tuesday, March 17 at 7:30pm, Wednesday, March 18 at 8:30pm (Opening Night), Thursday, March 19 at 7:30pm; Friday, March 20 at 8:00pm. Thereafter the schedule will be: Tuesdays, Wednesdays & Thursdays at 7:30pm; on Fridays at 8:00pm; Saturdays at 2:00pm & 8:00pm; and Sundays at 2:00pm & 7:oopm. PLEASE NOTE: There will be two performances on April 3 at 7:30pm & 11:00pm; there is no performance on Sunday, April 5 at 7:00pm. Tickets for CARRIE THE MUSICAL are priced from $40 - $70 and can be purchased at La Mirada Theatre's website, www.lamiradatheatre.com or by calling the La Mirada Theatre Box Office at (562) 944-9801 or (714) 994-6310. Student and Senior discounts are available. For more information on the production visit www.experiencecarrie.com.